Private keys and certificates should be uploaded in unencrypted PEM format. All subject names on the host certificate should match or be sub-domains of the domains that you'd like to serve through PageSpeed Service. Private keys must use RSA encryption. Maximum allowed key modulus: 2048 bits. Complete steps 1 to 4 of the PageSpeed Service setup process for your domain (e.g. www.example.com). Note: After completing Step 4 (i.e., adding the origin server), please do NOT change the CNAME record yet. We have a few more steps to go. Serving SSL traffic through PSS requires that your domain www.example.com be registered as the primary domain with Google Apps. 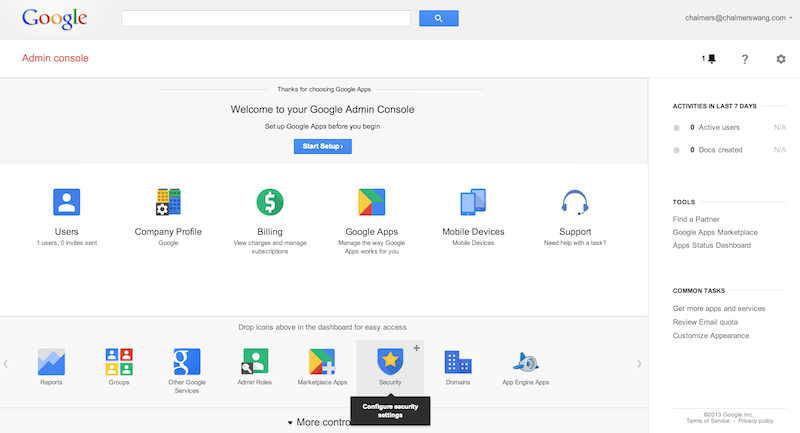 If your domain has already been configured with Google Apps move to the next step. If not, sign up for a free account with Google Apps. The domain that is set up on Google Apps control panel will be example.com and not www.example.com. Important: Please make sure to verify the ownership of the domain in your Google Apps account. Failing to do so will cause your domain to be automatically deleted. We require all uploaded certificates and keys to be in unencrypted PEM format. The information presented in this section will help you to create the certificates in the correct format. You will most likely need to generate a private/public key pair locally before uploading the unsigned public key to the provider in a format called a certificate signing request (csr). The command below can be used to generate a certificate signing request. To use the command you need to have OpenSSL installed on your local machine. The certificate signing request can now be sent to a certificate authority for signing. The provider will sign the request and return a fully formed/signed certificate shortly after. Note: If the host certificate requires an intermediate or chained certificate (as many Certificate Authorities (CAs) issue), you will need to append the intermediate or chained certificates to the end of the public certificate file. You will need to wait for a response from our support team before proceeding to the next step. Server Name Indication (SNI) (Recommended): This allows multiple domains to share the same IP address while still allowing a separate certificate for each domain. Virtual IP (VIP): Each VIP can only serve a single hostname, wildcard or multi-domain certificate. Currently, PageSpeed Service has a limit of 1 VIP per domain. Proceed to this step, only AFTER you receive a notification from PageSpeed Service support team. Go to Google Apps Control Panel for your domain and sign in. In order to get to your control panel, replace example.com with your domain name in this url: www.google.com/a/example.com. Navigate to the Security tab in your Admin Console, under More controls. 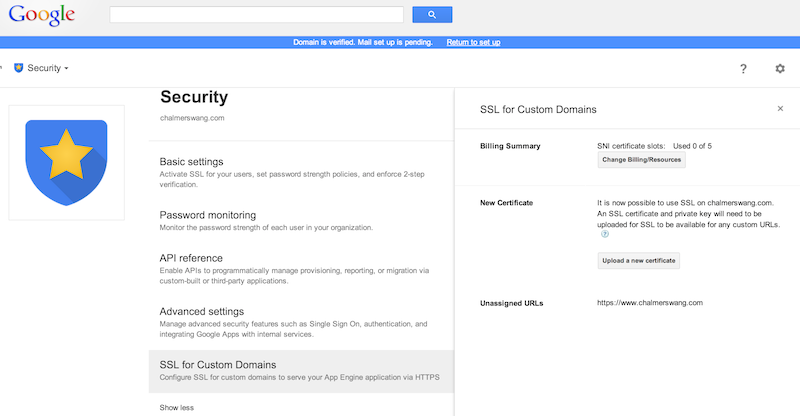 Navigate to the SSL for Custom Domains tab by clicking on “Show more” in the Security section. Add your request SSL slots, by clicking on "Increase your SNI slots by 5" or "Add a VIP". You can ignore the billing summary, since SSL support is free of charge for now. You will be informed about pricing information when it is available. Click on "Configure SSL Certificates". Click on the "Upload a New Certificate" button. When prompted, choose the certificate and private key files. Choose which URLs the certificate should handle. You can choose URLs from the drop-down list or add all matching URLs by using the Assign all Matching URLs button. If you are using SNI set the value of the CNAME record to pagespeed.googlehosted.com. If you are using VIP set its value as mentioned in the 'CNAME to' field. If you are using client IP address of the requests for monitoring, localization, etc, please make sure that you use X-Forwarded-For Http header. For details click here. Note: DNS changes can take up to several hours to propagate. Once the change is propagated, you will see that the status of your domain on PageSpeed Service console changes to Enabled. Visit www.digicert.com/help/ to check if your certificate is set up correctly.